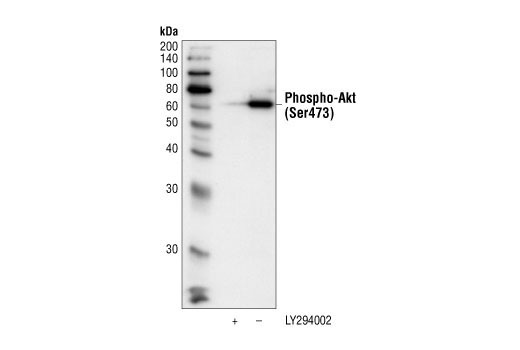 Akt phosphorylated at serine 473 was immunoprecipitated from untreated or LY294002 treated Jurkat cell extracts, using Phospho-Akt (Ser473) (587F11) Mouse mAb (Biotinylated). This immunocomplex was then pulled down using streptavidin beads. Western blotting was performed with Phospho-Akt (Ser473) Antibody #9271. Phospho-Akt (Ser473) (587F11) Mouse mAb detects endogenous levels of Akt only when phosphorylated at Ser473. This antibody does not detect Akt phosphorylated at other sites or related kinases such as PKC and p70 S6 kinase. This is a biotinylated version of the #4051 antibody and is expected to continue to recognize other species such rat and hamster. Monoclonal antibody is produced by immunizing animals with a synthetic phosphopeptide corresponding to residues around Serine 473 of mouse Akt.